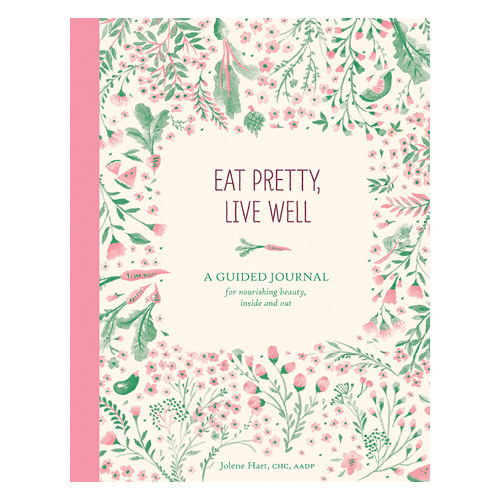 Eat Pretty, Live Well is a guided journal from expert wellness coach and nutritional aesthetics pioneer Jolene Hart, author of Eat Pretty, a resource to support natural beauty from the inside out. Beautifully designed, this journal stands on its own if you don't already own Eat Pretty. The journal provides detailed nutritional information, tools Jolene uses with her personal clients to assess their lifestyle, checklists and trackers intended to guide you to eat more mindfully and healthfully. If you are looking to discover and be supported in new eating and lifestyle changes, Eat Pretty, Live Well will make a great companion. You're sure to be inspired to give your skin, hair, nails and body a nourished look and feel with what you learn from Jolene. Published by Chronicle Books.